Scheduled club activities take priority over individual play. Please refer to the monthly schedule posted in the clubhouse and on the club’s events calendar on the website. Two, three, or four players may tag for a court. All players must be present at the clubhouse. If two or three players tag for a court, one or two additional players may tag for it as well to make up a doubles game. Empty courts should be tagged in preference to occupied courts. Consecutive booking is not permitted. Players who lose their court at turnover time may not tag on an adjacent court. The Supervisor has final word on time control; normally the clubhouse clock is used. When the Supervisor is on duty, tag indoors; otherwise use the outdoor chalkboard. Court 1 is the designated teaching court. The coach may ask players to give up the court. Court 2 is the designated singles court. However, players may be required to double up during periods of heavy usage, within ten minutes of the court start time. League and tournament play may occupy at most three courts. 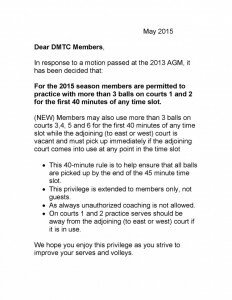 Use of the practice court is limited to 15 minutes, if others are waiting. 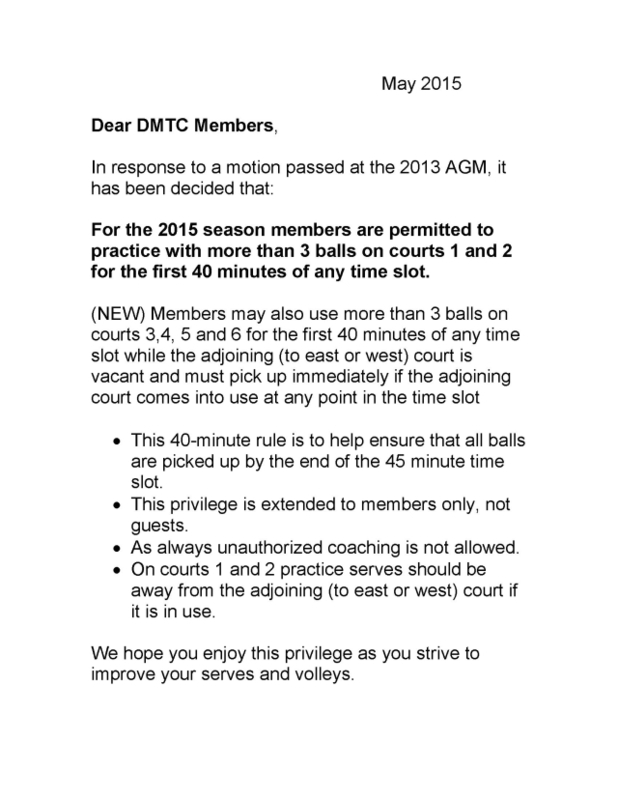 Members may also use more than 3 balls on courts 3, 4, 5 and 6 for the first 40 minutes of any time slot while the adjoining (to east or west) court is vacant and must pick up immediately if the adjoining court comes into use at any point in the time slot. This 40-minute rule is to help ensure that all balls are picked up by the end of the 45 minute time slot. This privilege is extended to members only, not guests. As always unauthorized coaching is not allowed. On courts 1 and 2 practice serves should be away from the adjoining (to east or west) court if it is in use. Courtesy and adherence to tennis etiquette are expected at all times. Profanity and abusive language are not tolerated. Club property is to be respected. Food and beverages in open containers are not permitted on the courts. Pets are not permitted on club grounds. Guests and non-members are required to pay the prescribed guest fee.